This recipe can be scaled up or down depending on the number of people to be fed. Serves: 3-4, depending on size of patties. Melted butter — not egg or breadcrumb — is the secret to a great binder for the meat. If you don’t have yellow onion for the patties, you can substitute 1/8 cup dried chopped onion or 1/4 cup white onion. Similarly you can substitute white onion for yellow onion in the burger toppings. While searing the burger patties, you may want to use a splatter guard. Buns can also be toasted in a toaster, but beware that the tops may also become a bit burnt! For the BBQ sauce I especially love Stubbs Sticky Sweet BBQ sauce. Sides that pair well with the burgers: fries, tater tots, or chili soup. Don’t forget extra BBQ sauce for dipping! In a large bowl, combine ground beef, Worcestershire sauce, melted butter, onion, garlic, salt, pepper, and cayenne if using. Use hands or a large fork to combine beef patty mixture until butter is cooled and mixture is tightly bound. Using your hands, shape the mixture into 3-4 evenly sized patties, slightly larger than the hamburger buns. For each patty, press your fingers in the middle to make a small dimple. Wrap and refrigerate patties for 10 minutes to allow mixture to marinate. While patties are marinating, make the burger toppings (see Toppings section). Heat oil in large skillet over high heat until just smoking. Place patties on skillet in a single layer, but do not overcrowd the pan. Let patties sear without moving for 1-1/2 minutes, or until brown on the bottom side. Transfer patties from pan to baking sheet lined with aluminum foil. Repeat steps 6-9 as necessary for additional patties, adding vegetable oil as necessary. Bake the patties in the oven until desired internal temperature is reached*, about 3-5 minutes for medium-rare. If using cheese, put cheese on top of each patty right before baking. While patties are in the oven, toast the buns. Place buns face-down on saute pan, over medium-high heat. Spread buns around the pan to gather the residual oils, then toast without moving until edge of buns are dark brown, about 1 minute. Repeat for remaining buns. Assemble the burger. Using a knife, spread 1/2 tbsp of barbecue sauce evenly on the bottom bun. 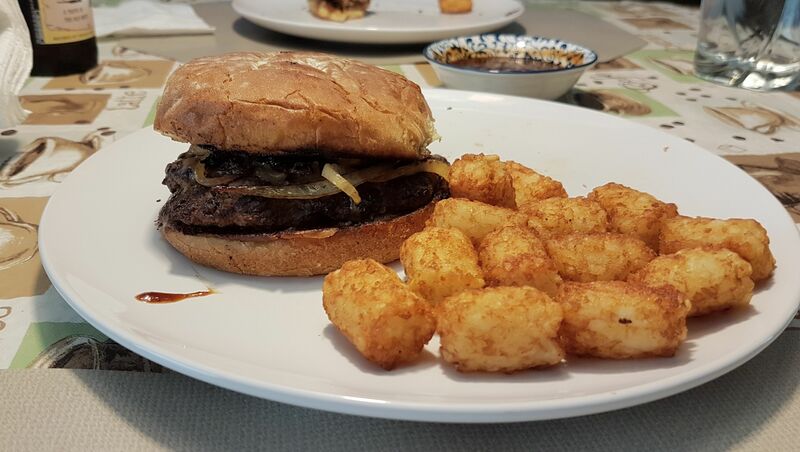 Place patty on top, followed by desired amount of toppings, and the top bun. Serve immediately. In a saute pan, heat 1 tbsp of butter over medium-high heat, until melted. Add sliced mushrooms to pan, and cook for 1-2 minutes until slightly shrunk and light brown. Add sliced onions to pan, sprinkle on top the salt and paprika, if using. Stir frequently until toppings are dark golden-brown, about 5 minutes. Transfer finished toppings to a small bowl. ∗ The FDA recommends that beef be cooked to a minimum of 160 F.
The inspiration for this cookbook comes from 100 Recipes, a great cookbook that I highly recommend. Currently a software engineer at Groupon. Recently graduated from the University of Washington, with a degreen in Computer Science and a minor in Music. Web development has been my passion for many years. I am also greatly interested in UI/UX design, teaching, biking, and collecting posters.